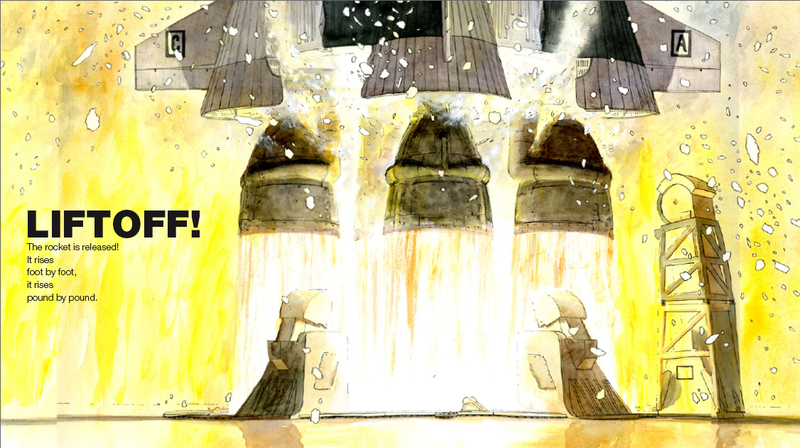 Today we celebrate the fortieth anniversary of the first manned mission, Apollo 11, to land on the Moon. Launched on July 16, 1969, it landed on July 20, and Mission Commander Neil Alden Armstrong and Lunar Module Pilot Edwin Eugene “Buzz” Aldrin, Jr., became the first men to walk on the moon, while Command Module Pilot Michael Collins orbited above. 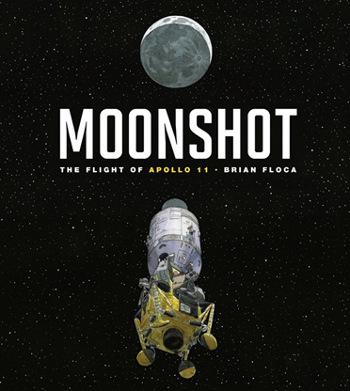 If you haven’t already seen a copy of Brian Floca’s Moonshot: The Flight of Apollo 11 (Atheneum/Richard Jackson Books, April 2009), you’re in for a big treat. And I’m going to give you a bit of a peek into the book today, since Brian indulged my over-enthusiastic request for some of the watercolor spreads from the book. …while the illustrations speak eloquently of the wonders of science, the free verse text positively sings. Within a single sentence, facts (the rocket is 30 stories high and weighs 6 million pounds) and artistry (“a tower full of fuel and fire”) keep company. In this beautiful amalgam of science and poetry, words, set free from gravity, merge into images that reverberate and soar. Michael Collins himself wrote, “Reading Moonshot gave me the feeling I was back up in space.” Man, that has just GOT to feel good to Brian Floca. Really good. I had two goals while researching and writing Moonshot: The Flight of Apollo 11. First, I wanted to find the information that I needed to make an accurate book. Second, I wanted to keep from beating the reader over the head with all that information. I wanted to be accurate but to evoke the mission, not exhaustively detail it. So, what has he done? 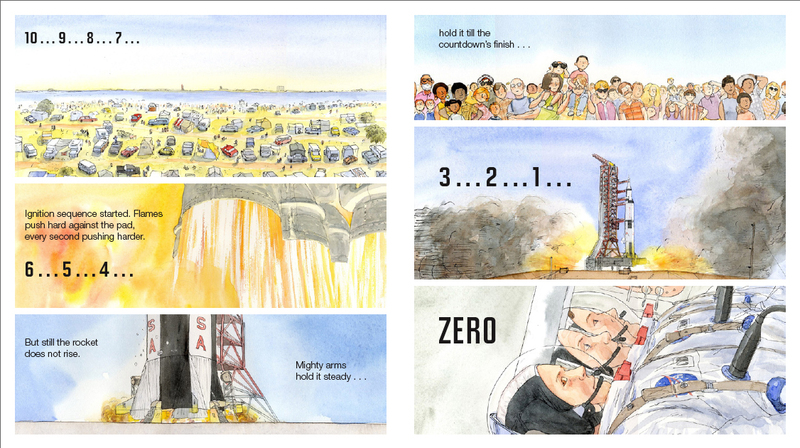 At that page of his site, “Moonshot Notes,” he has provided additional information about the book, the choices he made in writing and illustrating it, and fun facts for those who have read Moonshot and are full-to-bursting with questions about little details. As he puts it, it’s a resource for those of us who love annotated editions of our favorite titles, director’s commentary tracks on our favorite films, and footnotes. And, as a picture book nerd, I love it and now wish that more picture book creators did that. Perhaps Floca can start a trend? A girl can dream. Yes, I’m an annotation geek. So, take a look. “Moonshot Notes” is here. I’m going to close the Moonshot-portion of the post with one of the final illustrations from the book (which will enlarge slightly if you launch the image itself). Floca’s ability to capture the emotions of what it must have felt like to see this event on television in 1969 is spot-on. Look at the father: Exhaustion. A bit of disbelief at the magnitude of the event? Maybe some tears? The mother: Wonder. Awe. The children: Jubilation. Perfect. “And far away, / where friends and strangers lean to listen, / where friends and strangers lean to hear, / there comes a distant voice: / Armstrong, calling from the Moon, / calm as a man who just parked a car. / ‘Houston,’ he says. Thanks to Brian for sharing his artwork today. a stroll between the spaces. of knowing what we could only imagine. and coming up with forty-six pounds of rock. frigid as a lunar night. haunting the shadow of his bootstep. If you want to read about other nonfiction titles today, the Nonfiction Monday round-up is being hosted by Sherrie Petersen at Write About Now. All artwork courtesy of Brian Floca. All rights reserved. MOONSHOT: THE FLIGHT OF APOLLO 11. Copyright © 2009 by Brian Floca. Published by Richard Jackson Books/Atheneum Books for Young Readers, New York, NY. Reproduced by permission of the author. “Footprint” copyright © 2009 by Debbie Ouellet. All rights reserved. I’ve just placed a holds request on this book. If it’s about space, count me in. One thing: I always felt that Michael Collins should have been sent up in the subsequent visit to the moon to be able to get a look around. I know somebody had to stay on board Apollo 11, but it must have been so hard to have been so close to the moon and yet not be able to step foot on it. Check out The Man Who Went to the Far Side of the Moon by Bea Uusma Schyffert for a good children’s biography of Michael Collins. What a great post! The living room scene is almost exactly the one that played out at my house (we didn’t have a dog). My memories of that night are among the most vivid of my childhood. When I finally got to the Air and Space museum 10 years ago and saw the Apollo 11 capsule, I cried. 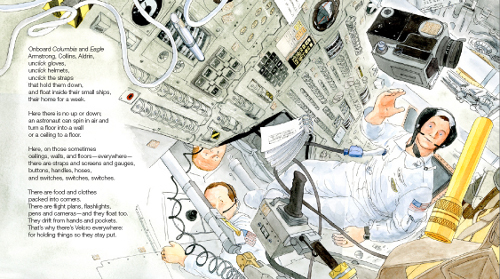 Hopefully, all these wonderful titles will spark new interest in space and get more kids thinking about science. Farida, I was thinking that about Collins as I typed this up. Thanks for the book tip. Catherine, that just HAD to be super cool to witness (the actual night-of, as well as the capsule). Thanks for sharing. Out of this world post (hee)! 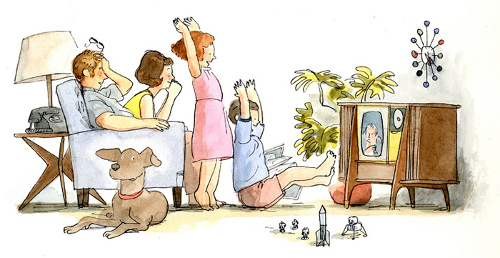 I remember the magical feeling of that day — miraculous that we could watch it on television. One of the many things I love about Moonshot is how he manages to convey all of the sounds from the blips to the blast-off. You can HEAR this book. Amazing. I worked for a summer — I’m pretty sure it was the summer of 1969, but it might have been ’70 — for RCA, in the mailroom of their Camden NJ facility. Once, we got this big old wooden box — like 4′ x 4′ — which we had to open and repack, ensure it would be safe during shipment and so on. Inside was a perfect, small (maybe 6″ across) scale model of the Eagle lander, on a lunar surface, being used for something-or-other… I think it was some kind of cross-promotion between RCA and NBC, which at the time were part of the same company. Seeing it felt eerily like participating somehow in the event itself.